I'm probably a bit late to the party here. Bincho Yakitori opened in Brighton a year ago to nothing short of fanfare. 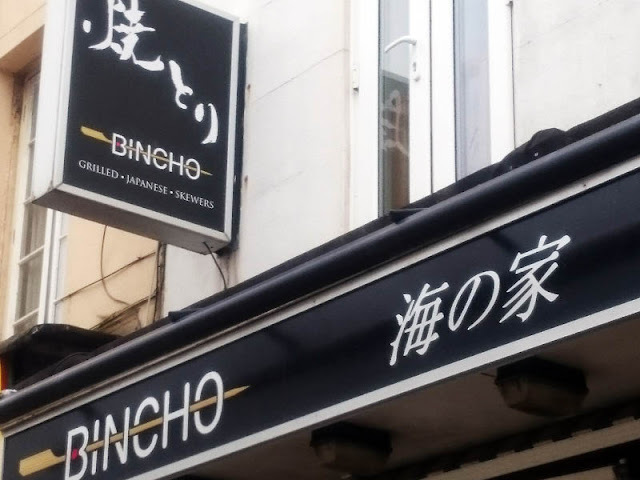 Modelled on a Japanese izakaya, a casual bar with food, this restaurant has an unusual background, beginning in London's glossy OXO Tower, then transferring to a hip Soho location before settling in er, Brighton's Preston Street. The ethos is also pretty low-key: "We won't waste your time or your money on unnecessary garnish". In the current restaurant landscape of borderline ridiculous flourishes and gratuitous presentation formats, I can totally get on board with these stripped back values. But I didn't realise how much I have come to rely on nice details and environments for dining enjoyment. And if I'm honest, this is what has kept me from Bincho Yakitori. The exterior looks like a a cross between a pawn shop and martial arts studio and being on Brighton's "restaurant street" with all of its illuminated perspex and laminated picture menus isn't exactly a bonus. The interior sits somewhere between being achingly cool and a touch scruffy. It's very minimal, dark, with walls covered in blackboard paint and chalk scrawls. Pictures of ambiguous Japanese urban scenes printed on thin, high street canvases are dotted around the walls. The area at the front with the open kitchen is far more attractive than the back. I don't know, somehow it has a charm about it but that line is painfully thin. But I couldn't ignore the feedback on the food, particularly from quite a lot of the local chefs. It seems this is where they like to eat and praise from chefs for another restaurant doesn't exactly come easy! The menu is formed from a variety of small plates, mainly grilled skewers (Yakitori) and prices hover around £4 per dish. Armed with a group of friends, this is an ideal way to sample a decent bulk of the menu. Everything, and I mean everything, was good with quite a few exceptional plates. Even the grisly and gruesome, the skewers of chicken skins and hearts, were genuinely enjoyable. I know eating gross cuts has become somewhat of a sport amongst true gourmands, but I have a line but here I was willing to cross it. Those skins and hearts were somehow transformed into tasty and tender, prepared and handled expertly so textures pleased rather than offended. 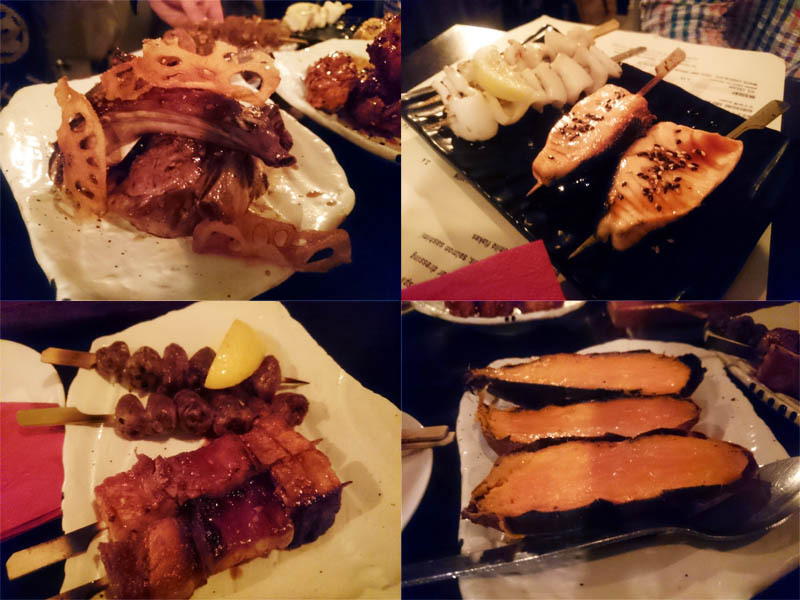 Amongst the crowd pleasers were the pork belly yakitori, the most acceptable of the fatty cuts. They were rendered beautifully, moist and melting. 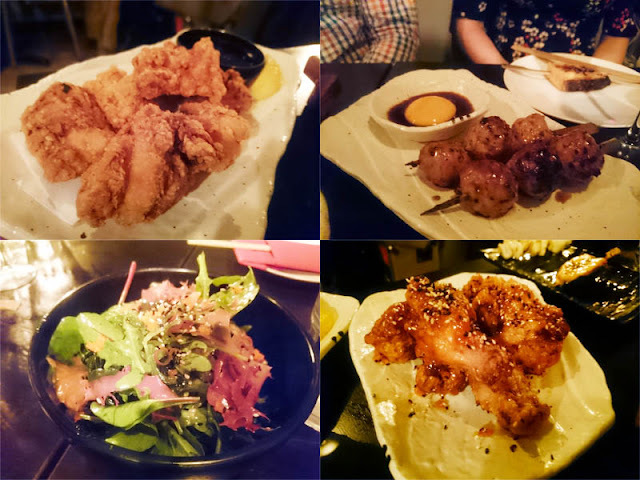 These got a second order as did the plates of crisp Japanese fried chicken and sweet, sticky Korean chicken wings. Chicken balls (that is, balls made from chicken meat) were made more interesting with a dipping egg yolk. I didn't get a look in on the two rounds of lamb chops or the salmon and squid, but they looked the part and were devoured in no time. Although you can easily go crazy on the protein, do give the vegetable dishes a look. The soft, sweet potato halves were gorgeous, brushed with a miso butter. A seaweed salad with salmon sashimi was generous and interesting and sweetcorn loves grills so this is a must order here. 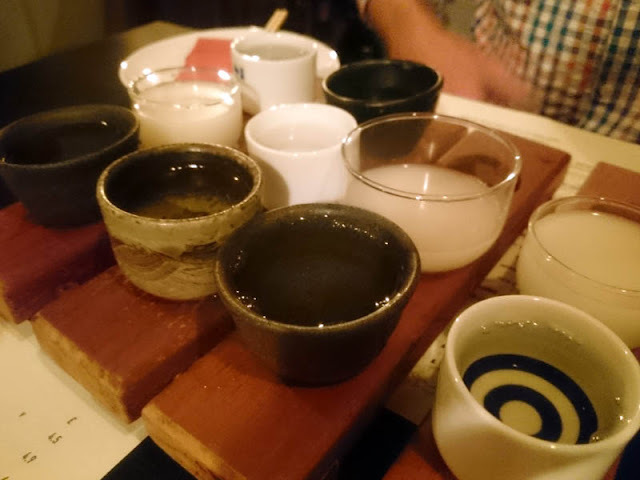 The sake flight was recommended to me and I say try it too. I have limited knowledge in this area so was fun to try three varieties. You are given an entry level sake, drinkable and pleasant, a cloudy unfiltered variety which was my favourite - milky, full of flavour. Finally was the premium sake, whose name translates as "beautiful girl from the south". This highest grade sake was super clean, refined and delicate. Sake sure has a new fan in me. 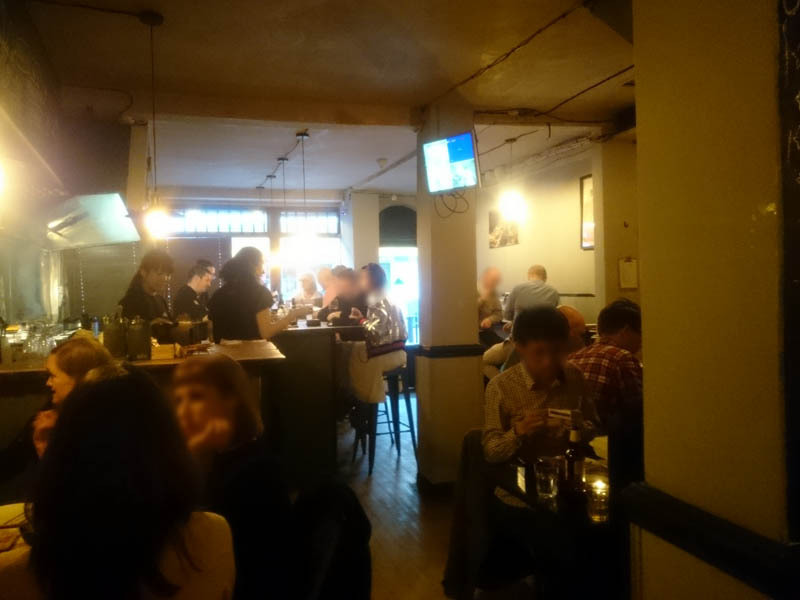 Service was welcoming and as friendly as it gets, yet well informed to guide you knowledgeably through the menu. 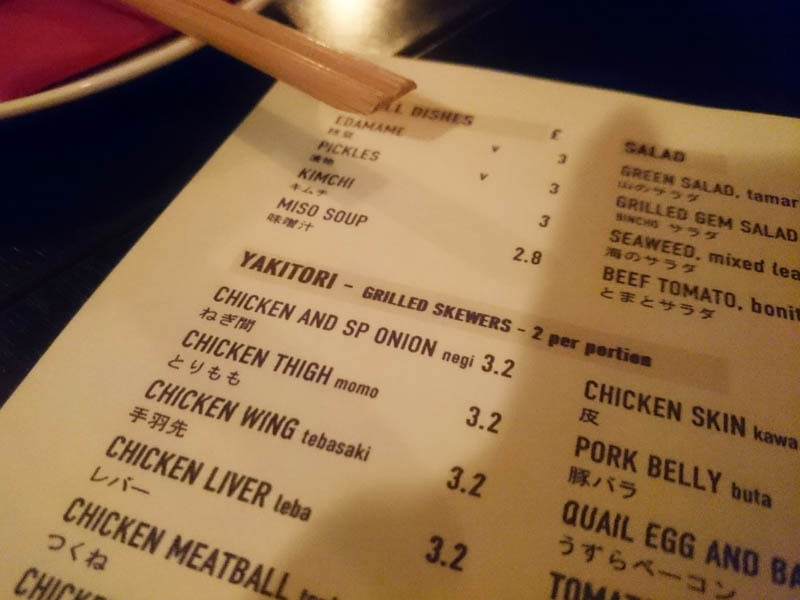 I didn't expect to like Bincho Yakitori much. On paper, it's not really my bag but I'll confidently say it's one of the best restaurants in Brighton, even after one visit (don't worry, I'll be going back again and again). The quality, care and craft of the food is as good as it gets so who the hell cares about presentation or how well weighted the cutlery is. It's both interesting and different for Brighton (as well as seriously well priced) which when you consider the diverse dining scene we have now, makes it really rather hot little ticket.